AFRICOM’s HQ in West Africa is up at the African Loft. It looks as if AFRICOM may go with a sea base for the West African regional headquarters. That way they can move it to whatever country falls within their interest. Who, why, and when will AFRICOM "stabilize"? US Marines engaged in an exercise off the coast of Liberia to test sea basing capabilities. An AFRICOM base has not been welcomed in any African country except Liberia. The Pentagon has been planning for some time to create sea bases where they may not be welcome on the land. Implementation of sea basing has now begun. And where better to practice than offshore of a country where they are welcome, and by bringing much needed medical and school supplies. With the help of the Navy’s Navy Cargo Handling Battalion One, 19 Marines of 4th LSB employed new concepts and equipment during the exercise designed to evaluate the progress of the seabasing model. 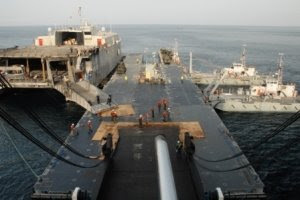 Assisted by their naval counterparts, the Marines’ mission was to transfer seven Marine Corps vehicles embarked on the USNS 2nd Lt. John Bobo of the Maritime Preposition Squadron One, to the Navy’s new Improved Navy Lighterage System. The INLS is a system of floating causeways designed to move equipment from ship-to-shore. 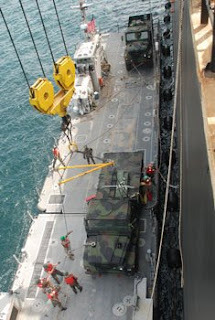 After a short ride on the INLS, the Marines drove the vehicles from the INLS platforms directly into the well deck of the USS Fort McHenry, where they are being prepared for the next phases of WATC 08. The exercise marked the first time that the INLS had been assembled and used in an open sea environment, Edmonds said. The capabilities provided by the INLS make it possible for the Marine Corps to operate in more flexible ways. MONROVIA, Liberia (March 27, 2008) (linked page by Marine Sgt. Rocco DeFilippis no longer available)– The streets were lined with hundreds of smiling faces and thumbs-up signs. Happy shouts of “Marines!” were directed towards a humanitarian assistance convoy of two seven-ton trucks and several humvees laden with thousands of dollars worth of hospital and school supplies making their way slowly through the city of Monrovia, Liberia. The supplies consisted of multiple disposable medical supplies, furniture, text books and other school supplies. The total value of the items to be delivered over the two days is $58,000. “It’s not only a great training exercise, but it’s a good opportunity to experience something new working with another country in peace-time environment,” said Lance Cpl. Brandon S. Malone, 4th LSB heavy equipment operator and Vienna, Ohio native. The convoy fits into the larger picture of WATC 08, by serving as a component of a sea-basing exercise. During the first phases, equipment aboard Maritime Prepositioning Ships USNS 2nd Lt John Bobo and USNS Lance Cpl. Roy M. Wheat was linked up with forces from aboard the USS Fort McHenry (LSD 43), assembled at sea and then transferred between the naval platforms using the Improved Navy Lighterage System. Using the causeways and ferry system that makes up the INLS, the Marines were capable of moving vehicles from ship-to-ship in open seas for the first time. I am very glad the US brought medical and school supplies to Liberia. I think the US owes Liberia a lot more than it has begun to deliver. But all of West Africa should take notice of this initial exercise in sea basing. AFRICOM is a combatant command. US assistance to Africa in recent years has mostly been massive military investment and transfer of arms and weapons, primarily to those countries that produce oil. A sea base provides far more freedom, flexibility, and access to interfere in the sovereign affairs of African countries. At this point, this is particularly true for West Africa and the Gulf of Guinea. The dangers have just gone up. Appointment of an old Africa hand as commandant of the Defense Language Institute at the Presidio of Monterey seems to reflect the emerging importance of that continent to U.S. military thinkers and planners. Army Col. Sue Ann Sandusky took command of the language school in October, the same month that the U.S. Africa Command (AFRICOM) — a unified combatant command of the Defense Department headquartered in Stuttgart, Germany, and responsible for U.S. military operations in, and military relations with, 53 African nations — was established. The command is responsible for all of Africa, except Egypt. Sandusky, 55, has served as a defense and Army attaché in U.S. embassies in Liberia, the Democratic Republic of Congo, Ivory Coast and Nigeria. She completed the French language course at DLI in 1992, and her first assignment to Africa was as a student at the Zimbabwe Defence Forces Staff College. Prior to her appointment as commandant of the language school, she was director of African studies at the Army War College at Carlisle Barracks, Pa.
AFRICOM will provide “a single focus on the continent of Africa” and be dedicated full time to the military aspect of U.S. policy there, she said. She also emphasizes the idea of “stabilizing” what they call “failed states”. One of the elements that has triggered military interest in the continent, she said, has been an effort to prevent parts of Africa from becoming “failed” or “fragile” states — “ungoverned spaces” where terrorists can organize and operate freely. That interest has been reflected in publication of a new Army field manual “that has elevated stability operations to the level of combat operations” in importance, operations that apply to failing states and nation-building, Sandusky said. “You don’t have to have an active, hot conflict to apply them,” she said, adding that AFRICOM sees its mission as more related to stabilization than combat. “It’s clear that a large component of stabilization has to do with understanding the culture you’re operating in. That is directly related to what we’re doing at DLI,” she said. The field manual “has institutionalized negotiations, understanding of culture and language” as valuable miliary skills, she said. Sandusky took command of DLI with a student body that has grown by 38 percent since 2001, to about 3,500. The number of faculty at the school has grown to 2,800, including 1,700 accredited faculty members. Based on information to date, “stabilizing” in Pentagon speak means preserving the ability of the US to extract resources comfortably without paying a fair price. 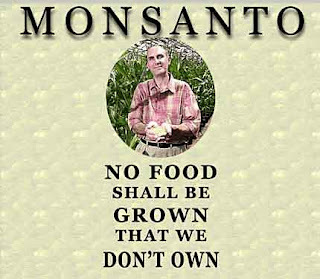 And a “failed state” is one that resists or is hostile to the US extracting its natural resources, especially oil. Africa is rich in resources, and many countries and corporations are lusting after them. Of course Kufuor has been very buddy buddy with Bush. And there is a huge ongoing US military presence in Ghana. The mention of Senegal above, and the fact that General Ward mentioned that country four times in his recent testimony (Ward testimony – PDF) makes me think they may be grooming Senegal to be the regional HQ for AFRICOM. Djibouti, JTF-HOA is supposed to be the model for AFRICOM. As I understand the planning now, they intend to set up a similar installation in each region. So talk of a single huge headquarters base is a red herring to distract observers from what is actually going on. There is a lot in this article, Africa: Africom vs. Peacekeeping, since time is short, I’ll just provide a few quotes that are right on target. The record of U.S. bilateral military engagement, whether in Africa or elsewhere in the world, provides little evidence to support the view that the effects will be positive. Those who support AFRICOM should have the burden of proof to the contrary. If anyone can cite an example of successful U.S. bilateral military engagement in terms of promoting peace and reconstruction, in the period since the post-World War II reconstruction of Germany and Japan, AfricaFocus would welcome referrals to evidence of such cases. The new command will also expand and intensify counter-terrorism operations in Africa and will make the continent a central battlefield in the Global War on Terror. Through AFRICOM, the Pentagon will intensify and extend U.S. counter-terrorism operations in Africa as well as its involvement in counter-insurgency warfare and other internal security operations in African countries. American troops are already engaged in combat operations in Somalia where air and naval strikes aimed at alleged al-Qaeda members instead killed dozens of Somali civilians in January and June 2007 and U.S. troops were engaged in combat-support operations in Mali in September 2007.